One of my favorite t hings about living in the South is the weather. You really never know. I’ve seen 70 degrees and sunny in January and I’ve seen snow in April. I’ve joked that in the South we have two seasons, Summer and the rest of the year. However, we’ve actually had some winter weather this week. Granted it was 63 last Saturday. The picture was taken outside off my front porch and it shows what we normally get here. Not fluffy blankets of snow, but hard hitting ice. Back in ’94 we had a terrible Ice Storm. 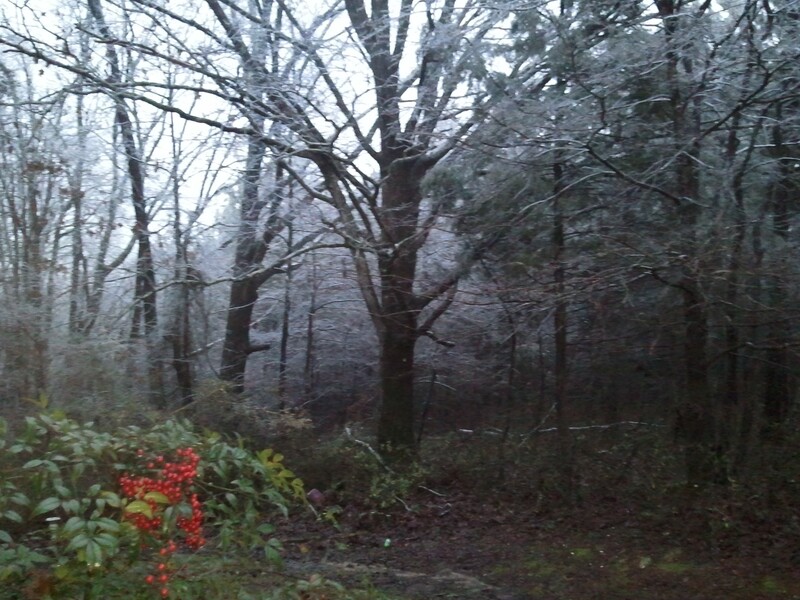 As a matter of fact, it is still called “The Ice Storm.” Power was out for much of the county for two weeks. The ice, when it comes, coats the pine trees and drags them to the ground. If it’s too much you can hear the popping and the cracking of wood before they crash to the ground. But the most “fun” is the ice coated powerlines. You get to watch the lights in your house dim and flicker and finally go out as the weight gets to be too much for the lines to handle. Thankfully, we have some great electric crews, law officers, and emergency personnel to keep us safe. That being said, here in the South we have a few rules for winter weather to keep you safe and secure and keep these nice folks from having to come get you. Rule #1 Before the storm hits, rush to the store and buy all of the Milk, Eggs, and Bread you can find. I’m not sure why we do this. The weather is normally clear in two days, at most. I guess it’s a hold over from the 2 weeks in ’94. While you’re out buying I recommend picking up some syrup, that way you can make french toast. Rule #2 Fill up every vehicle and every tank you have with gas. You can do this while you are out getting the groceries, saves a trip that way. Plus you never know, you may have to soak your furniture with gasoline so you can burn it for warmth. A lot can happen in 48 hours of cold. Rule #3 Have an alternate heat source. Your gasoline soaked furniture will only last so long. Have a pile of wood from last spring near by, or a kerosene heater, or lots of blankets and some really close friends. Either way, electricity goes out. Have a back-up. Rule #4 Call everyone you know and compare stories about the last spat of bad weather. This is so your friends and family will be prepared. Also, to let you know who is better prepared in case you’d rather hole up there. Rule #5 Make sure you, or someone near by has a chainsaw and a Four-Wheel Drive. This is to make sure you can get out the next day. Some people still have to make the dangerous trek through one inch of snow to get to work. Seriously, this is the South. We have no clue how to drive on Ice and Snow. The only thing that can happen by getting out is property damage and bodily harm. Rule #7 Get out of the House. Who am I kidding, no one in the South has ever been stopped by property damage or bodily harm. But, make sure you are out riding with the guy in the 4×4. Everyone wants to see how bad the ice is. But in all reality, it is dangerous so be careful. Rule #9 Don’t drive into a ditch. However, if you do. Don’t worry too much. Some guy named Bubba will be along with a Chainsaw and a 4×4 to pull you out. Don’t offer to pay them, they live for this. Rule #10 Keep cold weather gear in your car. It may take Bubba a while to get there, he’s busy pulling everyone else out of the ditch.